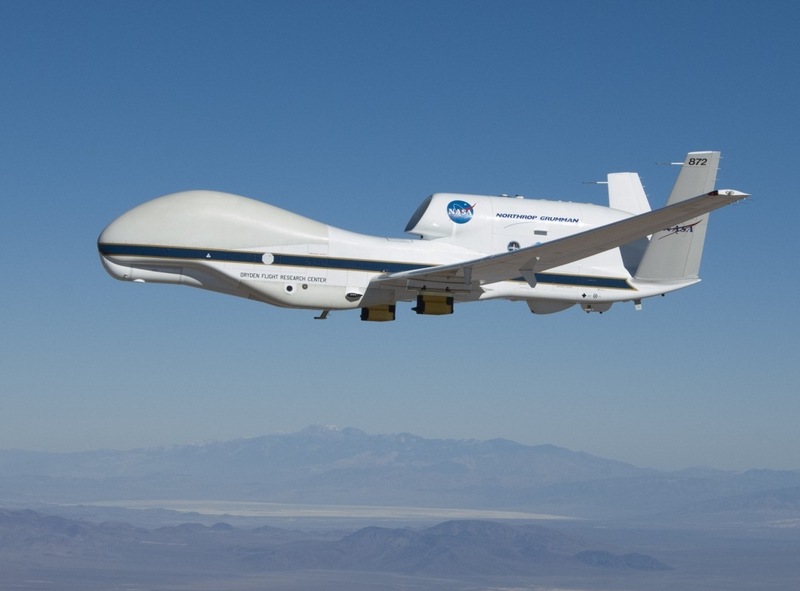 NASA’s Global Hawk 872 on a checkout flight from Dryden Flight Research Center, Edwards, Calif., in preparation for the 2014 ATTREX mission over the western Pacific Ocean. NASA’s uncrewed Global Hawk research aircraft is in the western Pacific region on a mission to track changes in the upper atmosphere and help researchers understand how these changes affect Earth’s climate. Deployed from NASA’s Dryden Flight Research Center in Edwards, Calif., the Global Hawk landed at Andersen Air Force Base in Guam Thursday at approximately 5 p.m. EST and will begin science flights Tuesday, Jan. 21. Its mission, the Airborne Tropical Tropopause Experiment (ATTREX), is a multi-year NASA airborne science campaign. ATTREX will measure the moisture levels and chemical composition of upper regions of the lowest layer of Earth’s atmosphere, a region where even small changes can significantly impact climate. Scientists will use the data to better understand physical processes occurring in this part of the atmosphere and help make more accurate climate predictions. Studies show even slight changes in the chemistry and amount of water vapor in the stratosphere, the same region that is home to the ozone layer, which protects life on Earth from the damaging effects of ultraviolet radiation, can affect climate significantly by absorbing thermal radiation rising from the surface. Predictions of stratospheric humidity changes are uncertain because of gaps in the understanding of the physical processes occurring in the tropical tropopause layer. ATTREX is studying moisture and chemical composition from altitudes of 55,000 feet to 65,000 feet in the tropical tropopause, which is the transition layer between the troposphere, or the lowest part of the atmosphere, and the stratosphere, which extends up to 11 miles above Earth’s surface. Scientists consider the tropical tropopause to be the gateway for water vapor, ozone and other gases that enter the stratosphere. For this mission, the Global Hawk carries instruments that will sample the tropopause near the equator over the Pacific Ocean. “Better understanding of the exchange between the troposphere and stratosphere and how that impacts composition and chemistry of the upper atmosphere helps us better understand how, and to what degree, the upper atmosphere affects Earth’s climate,” Jensen said. In 2013, for the first time, ATTREX instruments sampled the tropopause region in the Northern Hemisphere during winter, when the region is coldest and extremely dry air enters the stratosphere. Preparations for this mission started in 2011 with engineering test flights to ensure the aircraft and its research instruments operated well in the extremely cold temperatures encountered at high altitudes over the tropics, which can reach minus 115 degrees Fahrenheit. ATTREX conducted six science flights totaling more than 150 hours last year. Jensen and Project Manager Dave Jordan of Ames lead the ATTREX mission. It includes investigators from Ames and three other NASA facilities: Langley Research Center in Hampton, Va., Goddard Space Flight Center in Greenbelt, Md., and the Jet Propulsion Laboratory in Pasadena, Calif. The team also includes investigators from the National Oceanic and Atmospheric Administration, the National Center for Atmospheric Research, universities and private industry. ATTREX is one of the first research missions of NASA’s new Earth Venture project. These small and targeted science investigations complement NASA’s broader science research satellite missions. The Earth Venture missions are part of NASA’s Earth System Science Pathfinder Program managed by Langley.